After the death of Sulla, there were several attempts by populists to dismantle his constitution, first by the Consul Marcus Aemilius Lepidus, and later (successfully) by Pompeius Magnus and Crassus. As a result, Pompeius, Crassus and Julius Caesar created a private alliance known now as the First Triumvirate. With their backing, Julius Caesar was elected to the consulship in 59 BC. Obverse: Bust of Ceres right, between wheat-ear and barley corn; III-VIR across fields, BROCCHI below. 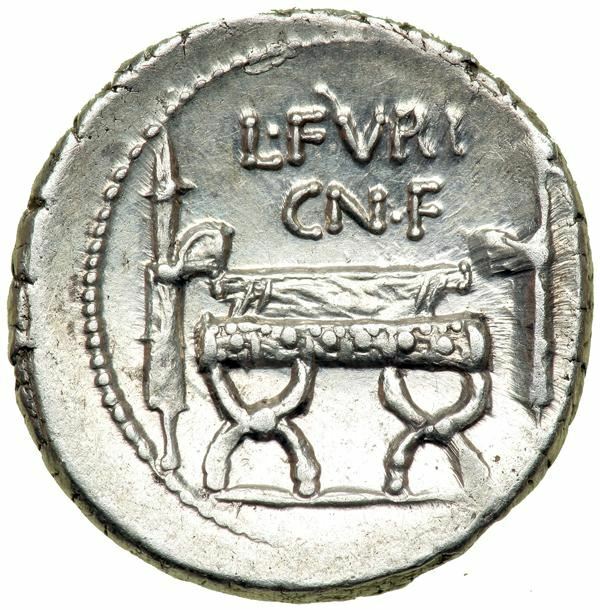 Reverse: Curule chair between fasces, L•FVRI CN•F above.